Delighted Peter Ward welcomes his first hat trick in two seasons. And a stirring display from his team mates on a snow-covered Molineux pitch last night gave Albion a deserved 3-1 pre-Christmas success over Wolves. Albion adapted better to the freezing conditions to pull off a shock victory – their first ever against Wolves – and the only surprise was that Ward didn’t score four. 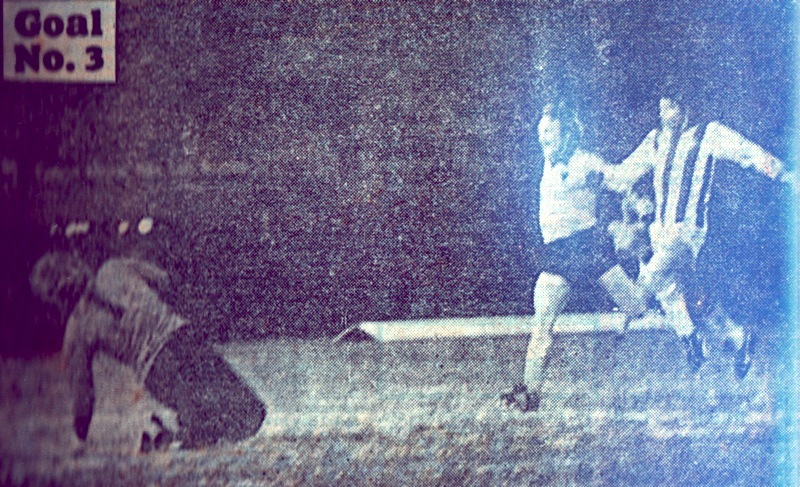 Wolves, without key strikers Andy Gray, Britain’s most expensive player, and John Richards, were unable to cope with Ward’s speed and balance. This was the Ward who dazzled when he broke Albion’s scoring record and gained England under-21 recognition. The ability to take on defenders in tight situations, and finish with deadly accuracy means that Ward has at last proved himself a First Division player. The way he destroyed Wolves, however, was due in no small part to a harworking and inventive midfield. It was in this department that Wolves failed to match Albion in the first League meeting of the teams. 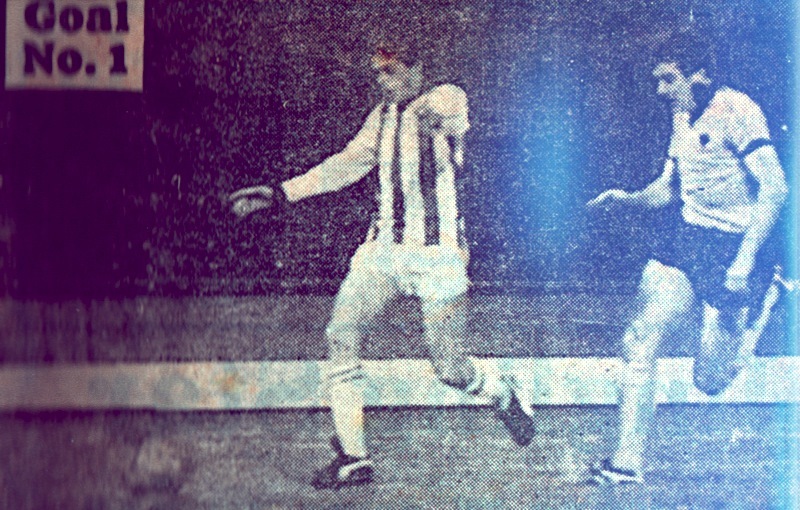 More than one wearer of the famous gold shirts dropped his head as Albion went in at half-time 2-0 ahead. Victory is made up of many ingredients, and kit man Glen Wilson played an important part by having the foresight to a set of special snow boots for each man. All but John Gregory chose the dimple-soled footwear and were able to keep their feet much better than Wolves. Maintaining a foothold became more difficult in the second half as the  temperature dropped even lower, but by that time Albion held Wolves in a firm grip. When Ward completed his hat-trick 20 minutes from time, Wolves knew they had met their match. The lone reply came seven minutes from the end. It goes without saying that this unexpected win must greatly improve chances of defeating Crystal Palace on Boxing Day and Manchester City the following Saturday. Fortunately, the results of other strugglers went in Albion’s favour last night, with Bolton, Stoke and Bristol City all losing. It only needs Albion to retain this mood, and they will emerge from the bottom three, for I cannot believe this was a flash in the pan. 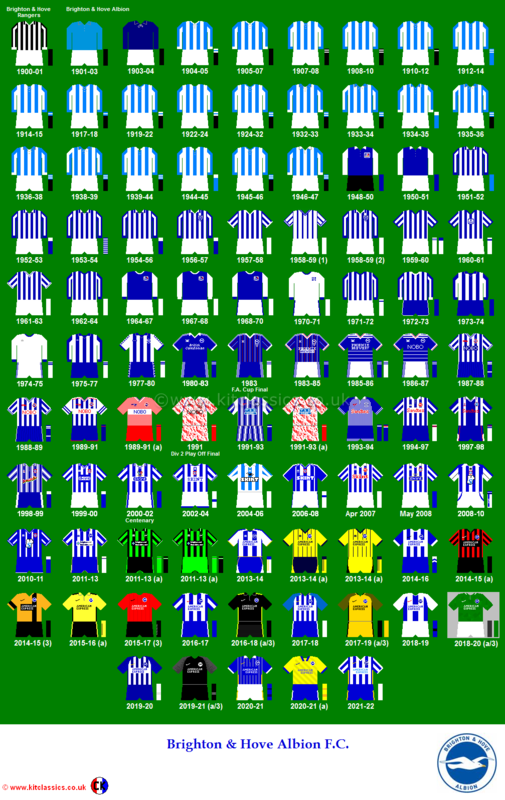 There was too much dedication tot the entire 90 minutes to regard it as a time when Albion got lucky. Every time they went forward, Wolves’ square defence wilted under pressure. Wisely, manager Alan Mullerv did not include Steve Foster, whose strained hamstring would have put him at a serious disadvantage. So Gary Stevens partnered Peter Suddaby, and Suddaby, in his last outing before a three-match suspension, had an absolute stormer. Early Wolves’ pressure was soaked up, but Albion had to thank striker Ray Clarke for heading off the line at 19 minutes. A corner by Kenny Hibbitt curled straight to the head of Wayne Clarke, only for his namesake to deny Wolves a vital opener. Then, five minutes later came an extraordinary miss by Ward. A lovely through by Sully opened Wolves’ defence, and Ward skated through. When Paul Bradshaw came out and got a hand to it, he left a yawning open goal. Ward hit the ball towards it, but with not enough pace to carry, and he continued in pursuit with Bradshaw stranded. As he was about to apply the finishing touch, Derek Parkin, hurtled in, and Ward stabbed wide. 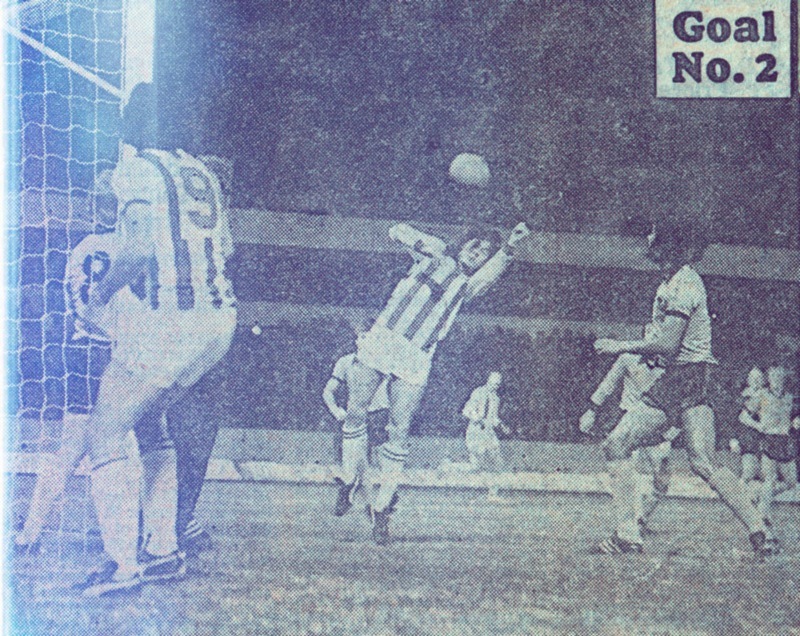 Ward could not believe it and Wolves started to put Graham Moseley under pressure, He got down smartly to a 30-yarder from Geoff Palmer and then held on to the frozen ball at Clarke’s flailing feet. 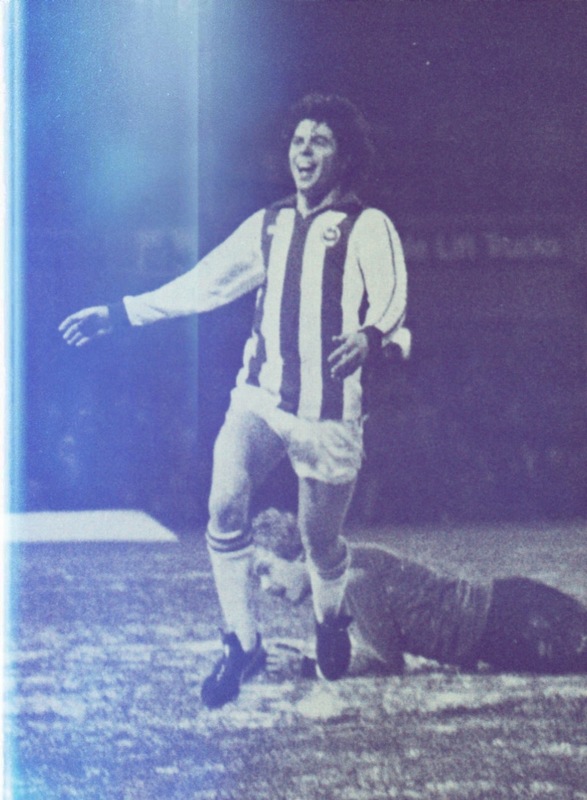 But soon Albion were menacing again, and at 36 minutes a short ball from Sully found Brian’ Horton. Sensibly, he did not run with it. Instead, a long pass down the right was brilliantly anticipated by Ward, who sprinted away. The original pass was so accurate that it left Ward with nobody to beat except Bradshaw. He had no option but to leave his line, and when he did Ward rifled home. That made up for the earlier mistake, and a minute from the break he put a stranglehold on Wolves with the sort of goal that is hardly his speciality. Ward’s strength is control and pace, and the number of goals he has scored with his head are few and far between. This one arrived after John Gregory’s long ball to the far post was scrambled for a corner. A short ball from Gerry Ryan found Gregory, and in went the far-post cross. Ray Clarke headed on for Ward, and his nod from point blank gave George Berry no chance, for when he made contact the ball had already crossed the line. Coming at such a time, this goal was a powerful boost, and Ward clearly was in the mood for more. Another precise little chip from Sully early into the restart found Bradshw and Berry in some confusion to clear from Ward on the edge of the box. Nearly… but not quite. You could see the damage Ward had created in Wolves’ minds. They just could not get hold of the smallest man on the pitch because he had the pace and balance to outsmart them all. For a short while, Wolves asserted pressure, Moseley saved from Willie Carr, and Gregory completing the clearance. When Ward hit the third, the goal carried the hallmark of class. Again Sully was involved. When the ball was played forward, Ward was onside which is all that mattered. By the time he received it, just over the half-way line, Wolves thought he was offside. The hesitation was fatal as he aced away to plant it firmly past the advancing Bradshaw. Wolves: Bradshaw; Palmer, Parkin, MeAlie, Hughes, Berry, Hibbitt, Carr, Clarke, Eves, Thomas. Sub: Brazier for McAIle (withdrawn, 58 minutes).